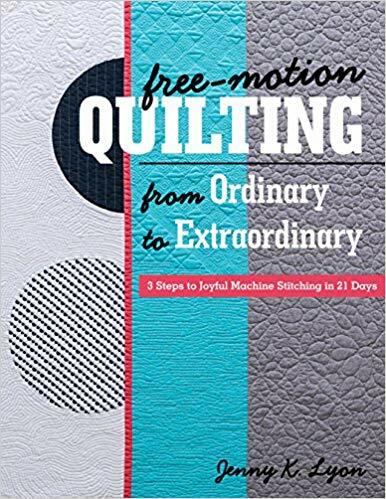 Jenny Lyons wrote a book about free motion quilting on a home sewing machine. I was excited to give it a read and see what I could learn. The really exciting part is that the book is for quilters like me. Those who have taken a few classes but still aren't always confident enough to quilt our best quilts. After reading through the book I started on the first part by "placticing." Play + Practice = Plactice. Jenny recommends a program of Plactice that is 21 days long. I'm almost through my first week and I already am seeing improvements. I'm slowing down and enjoying the process of placticing. I needed to create some postcards for the Stay Pawsitive fund raiser being done at Craft Napa next month. 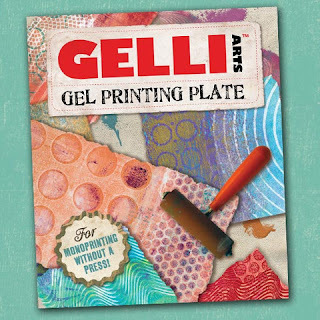 Jenny gives some good tips on making post cards on page 43. Post cards are such a great project to practice on. 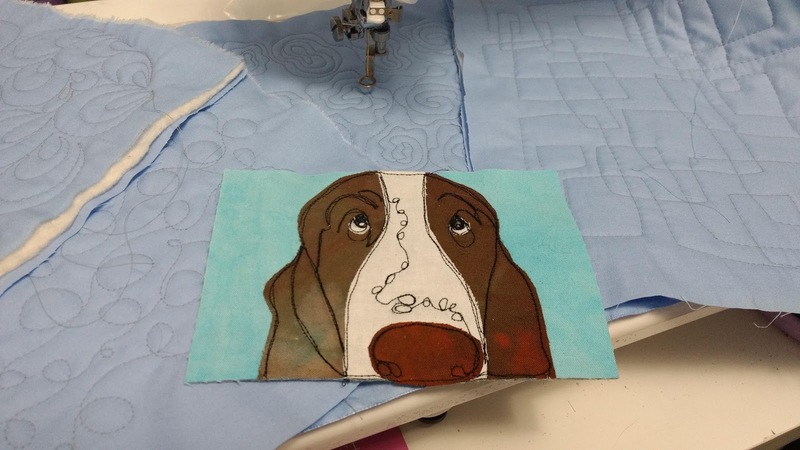 Jenny's pup, Zeke, inspired me to make a basset hound postcard. I used the loops I placticed to make the spots on his nose. I think he approves. I also think he wants a sister and brother. I look forward to trying out Jenny's method of Quilt As You Go. It's different than any method I have seen before! _ Leave a comment on the blog to enter for a chance to win a copy of Jenny's book! – You can enter each day, on each new person's blog post, but can only win once. – Each blogger will leave the comments open for 8 days and then will choose a winner using a random method. – Jenny will send the winners a signed copy of her book. – If you find a blog along the way that you find interesting, sign up to receive notices of each future posting. This is a talented group! – International winners will receive a digital copy. Good luck and Happy Placticing! I like 21 days as it seems doable. A program of playing everyday really appeals to my inner child. What a bonus that it will help me get better at something I love to do. I know my trouble with FMQ is that I don't practice. The 21 days builds a habit, which is a great idea. Thanks for the chance to win a copy of this book. Love the dog postcard! Do the postcards need to be animal themed? Or could I send some that I have on hand? Looking forward to placticing to become a bettter quilter. Can’t wait!!! I would love to win Jenny's book! I have been practicing but I love to see what you have accomplished. I'm excited to start "placticing" too. You have motivated me to start today! I have my quilt sandwiches made. What a beautiful book. I would love to win. I took a class from Jenny years ago at a small local shop and learned so much. My only crime is I don’t practice enough, her book and 21 day plan is the perfect antidote. Yes. I agree, practice, practice and practice some more. Love the term "plactice".... definitely what I need to do! I agree that practice, practice, practice makes perfect. 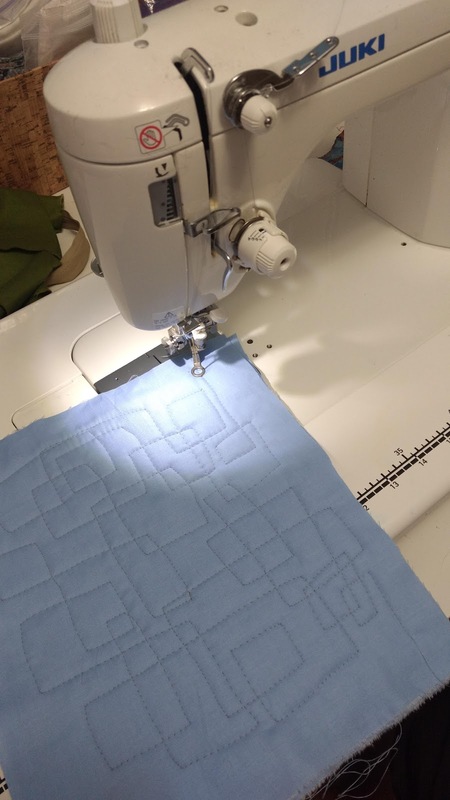 Even if you are good quilter, practicing makes you better. We all need to take the time to practice. I would love to have Jenny's book and I too, love the word "plactice" It does sound like more fun. I like the word "placticing". Alas, practicing FMQ has always seemed rather a chore to me...but if Jenny makes it fun, I'm willing to give it a try! Thank you for sharing about Jenny's book. I think that opening your sewing practice tp plactice is a grand idea. When we learn a new pattern, we should use it as soon as possible. Loce your card. I love what free motion quilting does to a quilt. I am placticing moving away from my standard "go to's". I decided to do this when I took Jenny's class. It is easy to get lazy and do the same cool thing all the time. Now I push myself to branch out. Flames, anyone? I enjoyed your comments, Lisa, about Judy's book. And the SLOW DOWN advice is so spot on! Nice job with the quilting! Jenny's book looks like a great one to put on the wish list! Thanks for sharing. Hi Jenny's book looks very informative. Hope to win. I’d love to win Jenny’s book. Thanks for the opportunity. This is on my Santa list. I've always been afraid to even attempt anything besides straight, in the ditch machine quilting. The best way to put it is that my machine and I haven't become one. Thanks for the review with your practice pieces. I loved the class and can't wait to get a copy of the book. Congratulations!! OOPS, didn't check the follow-up box. It is known that This book will be amazing! I like the idea of plactice- much more fun than mere practice- I will start tomorrow! Love the play + practice and having fun learning to free motion. Mary Ann. Plactice, what an entertaining word. I need to get some quilt sandwiches really so I can play! Oh I have 2 Basset Boyz! Love those long noses to practice on. Very interested in rebuilding my library after losing it all in the flood here in Louisiana. Slow going, but I am getting some quality books that I love. It seems like the practice I get is on my actual quilt. At my age I have to keep moving forward if I want to make all the quilts I've imagined. Your fabric printing looks inhabitant so I'm interested in checking out your blog. Thanks for the advice. 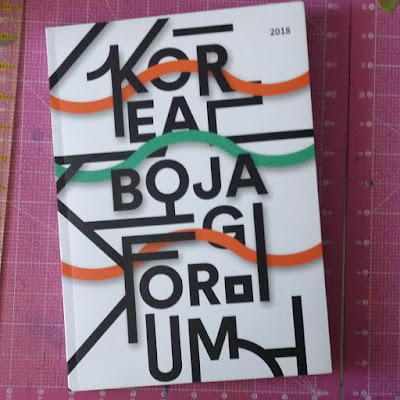 What a nice blog - and information about what looks to be a wonderful book! Your bassett hound is adorable! I think Jenny's book should be wonderful, since she's such an encouraging, supportive teacher. I'v been looking at that book. Glad you liked it and it is all about practice. Love your little bassett hound! LOVING the practice pieces you are creating and that you are starting to commit time under Jenny's guidance to a daily practice that will make those amazing and adorable doggy noses just SING - just so cute! I would love to add the book to my library! Thanks for sharing! Free motion quilting is one skill that I have yet to develop. This looks like it would b a good place to start. This book sounds very interesting. . . a new way to quilt as you go has me intrigued. I have had the pleasure of taking a class from Jenny when she spoke to our guild. She is a wonderful teacher. Thanks for the tips! I would love to win a copy of this book. I really need to work on my free-motion skills. I've done a little, but am nowhere near good enough to try it on a quilt to enter in a show. This book would be a start toward improvement. I really need to up my FMQ game. This book looks great! Great idea to practice with a postcard size. Gives me a good excuse to make some mug rugs. Practicing helps you find your own rhythm and speed for that perfect stitch. It might be fast or it might be slow... but once you find it .... you just need a bit of warm up, each time. Looks like a good book - I like the idea of "placticing"! Placticing for 21 days sounds more like fun than work and quite doable. I practiced for a year before I quilted any of my tops. I now think quilting is the best part of the process. Great advice! I’m so easily distracted but just doing a small square daily sounds really doable and it will be fun to see the progression as improvement (I hope) is seen! Interesting site and new book by Jenny. Would love to win a copy. Great placticing! I would love to win Jenny's book! I can always learn something about quilting in every book. I would love to win the book! I tend to not practice enough. As a result, I've got go to FMQ designs I use but I'd really like to expand my knowledge. This 21 day plan might give me the incentive. The only way to improve is to actually have a go! Hi Lisa, Love seeing all of your letter stamps. So inspiring! Thanks for the opportunity to win one of Jenny's books. I sure could use the Plactice! Practice takes discipline, not to mention time, and Jenny's new book sounds like a wonderful motivator! I'd love to win a copy! It occurs to me that there are two aspects to improving on FMQ. Practicing to improve skill and self forgiveness at not being perfect. Love the basset! We’ve had three of them as pets. Sounds like a great book. I could do 21 days FMQ -- great idea and I would love to have this book to learn FMQ. I've tried a tiny bit of FMQ. My goal for 2019 is to learn. This book looks excellent. I need to practice more and lose the fear. I took Jenny’s class, then got busy and forgot to practice. Hoping to win the book and start over. Thank you for this wonderful opportunity. 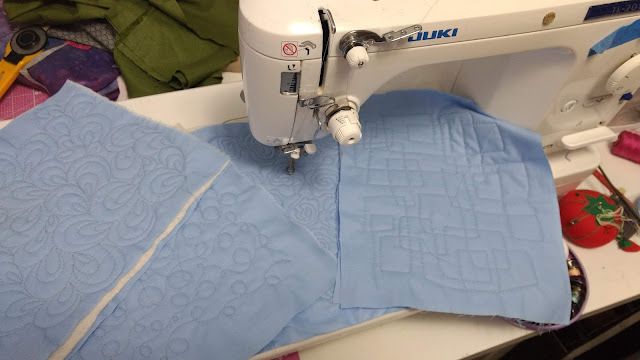 I need free motion quilting help. and hopefully this book will be it. I’ve been practicing off and on since I took her class. Need to try it continuously for 21 days. Using my favorite thread of Isacord because it works well in my machine. This book looks like it has lots of useful info and encouragement to improve our fmq skills!